A new prototype radio telescope has begun observing the universe at the U.S. Department of Energy's (DOE) Brookhaven National Laboratory. Constructed by a team of scientists, engineers, carpenters, and students, the prototype telescope was funded through Brookhaven's Laboratory Directed Research and Development program. Brookhaven scientists and collaborators will use the small prototype to test the merits of a radio telescope on-site at the Lab, develop new ways of attacking fundamental problems, and break into the field of 21 centimeter cosmology—the study of our universe's origins through radio signals emitted by hydrogen gas in distant galaxies. Cosmologists have primarily used optical telescopes—telescopes that observe space through visible light—to study galaxies and their distributions in space and time. These telescopes are extremely advanced, and ones like the Large Synoptic Survey Telescope (LSST) now under construction in Chile are fully optimized for cosmological applications; however, optical telescopes are also extremely expensive to build. That's why Brookhaven is investigating radio telescopes as an alternative, cost-effective way to observe the universe. "If we want to learn more about the universe, radio telescopes are an exciting way forward," said Chris Sheehy, a physicist at Brookhaven. Radio and optical telescopes have a similar design: they both include a camera and a focusing element that reflects light to generate an image of the universe. But unlike optical telescopes, which use a glass mirror to reflect visible light, radio telescopes can use a metal reflector dish that costs about 100 times less than a glass mirror of the same size. "Radio waves are like normal light, only with much longer wavelengths," said Anže Slosar, a physicist at Brookhaven Lab. The long wavelengths of radio waves cause radio telescopes to produce a picture of the universe with much lower resolution than what an optical telescope of the same size could produce. In traditional radio astronomy—the study of individual celestial objects using radio waves—very large radio dishes or a collection of widely separated dishes are used to improve image resolution. For cosmological applications, however, a different kind of radio telescope is needed: one that can observe large patches of the sky with extremely precise intensity, but only modest resolution. "Having a small radio telescope that sees a very blurry picture of the universe is OK," Slosar said, "because we are not interested in observing individual objects. We can measure big swaths of the universe and still measure the same statistical quantities that we normally do using galaxies." A highly sensitive radio telescope is necessary for cosmologists because their observations rely on a very weak signal from neutral hydrogen gas, a cosmological marker that is found in all galaxies. 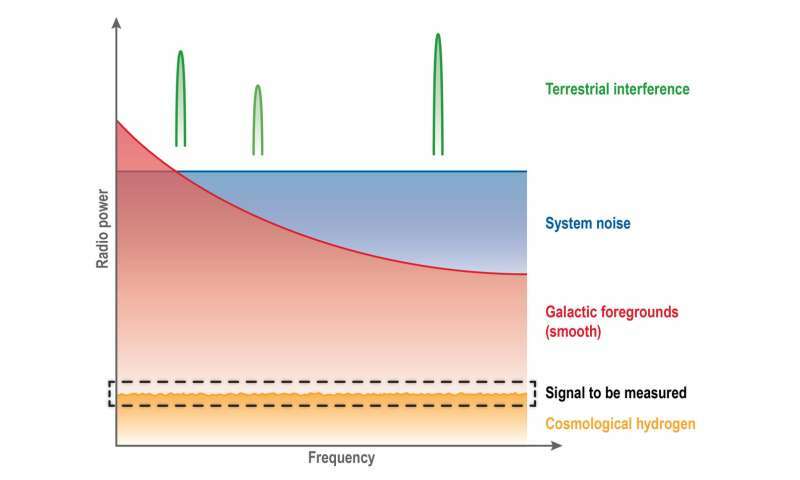 The hydrogen signal is so weak that it can only be detected by carefully subtracting out noise and interfering radio waves from our own galaxy (see Figure). Cosmologists at Brookhaven are not the first to search for this cosmological marker; a fully funded experiment called the Canadian Hydrogen Intensity Mapping Experiment is underway, and a similar effort is being considered for South Africa. The Brookhaven experiment is considerably smaller, but its aims are different. "Rather than going straight towards a competitive experiment, we are starting with a small R&D prototype to develop the technique," said Hindy Drillick, an undergraduate student at Stony Brook University who is participating in the experiment. "We have a beautifully flexible system that one can walk to, fiddle with, and quickly try different techniques." The Brookhaven team hopes to use the prototype to develop and test novel calibration and characterization techniques for radio telescopes. Observing very distant galaxies is a difficult task because their starlight appears very red, a result of the ongoing expansion of the universe. Red light requires more expensive detectors to be observed and is more likely to be absorbed in the atmosphere. Distant galaxies are also intrinsically fainter and fewer in number. "Compared to optical telescopes, radio telescopes can see further out—further back in time and further distances in the universe," said Paul Stankus, a physicist at Oak Ridge National Laboratory and a collaborator on the radio telescope. Radio telescopes are also particularly convenient for cosmologists because their design eliminates the need to adjust the position of the telescope. "If you wanted to look at a star with an optical telescope, you'd have to continually adjust the position of the telescope get a clear picture. But we can point our radio telescope straight at the zenith, and let the sky move past the telescope as the earth rotates," said Will Tyndall, a graduate student at Stony Brook University who is currently working with the telescope. "You can imagine it as if you were observing a Jackson Pollock painting. Using an optical telescope would be the equivalent of looking at every single dot in the painting, and then putting all the dots on a graph to see where they are located. Using a radio telescope would be slowly looking at the painting from left to right to see the whole picture." Moreover, radio telescopes can be electronically steered and don't require the costly tracking motors used on optical telescopes. Brookhaven's prototype telescope is situated on Lab grounds, where radio frequency interference generated by the nearby weather radar, broadcast TV, and cell phone towers complicates observations. Managing the radio interference with the prototype will prepare Brookhaven scientists for taking accurate measurements of the universe with a more advanced telescope. "Unless you go to the back side of the moon, there's always going to be radio frequency interference, even in the middle of the desert," said Paul O'Connor, a senior scientist at Brookhaven's instrumentation division, "so we have to understand how to mitigate that interference to improve our observations. If we can do it at the Brookhaven site, we can do it anywhere." 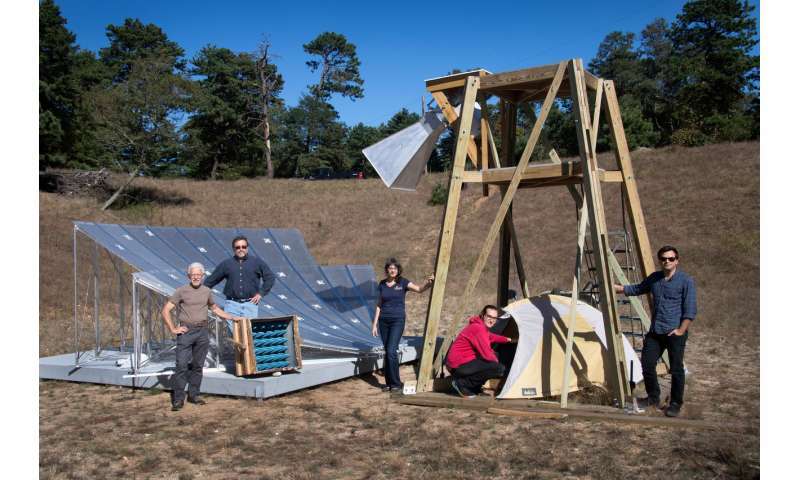 The group expects to spend about five years experimenting with the prototype to demonstrate the promise of radio telescopes for cosmology studies at the Lab, and to test various design choices for an advanced experiment. The prototype is a collaborative effort between the Physics Department and Instrumentation Division at Brookhaven. "This combination is uniquely powerful," Slosar said. "Our laboratory enables this strong connection between those who know the nuts and bolts of hardware and those who can do high-level analysis." The two groups have been collaborating on LSST for over a decade, and the radio telescope could extend this collaboration after the LSST construction project is completed at the end of the decade. In parallel, Brookhaven scientists are collaborating with other national labs and DOE-supported universities to build the case for a larger radio telescope. The experiment would be situated on a remote site, and would involve many DOE labs and potentially other agencies. Successful observations from Brookhaven's prototype would be one of many important examples to support such an experiment on a larger and international scale.